When we planned our trip to The Needles District of Canyonlands National Park, The Lady of the House and I decided to camp the night before our visit. At that time of year (early April) The Needles (Squaw Flat) campground in the southern section of the park is on a first come-first served basis, and we didn’t know if we could get there early enough in the day to snag a campsite. We looked at the Free Campsites website in hopes of finding something totally free close to the park entrance, but the free spots we found were father away then we wanted to be. We ended up figuring things out on the fly due to a four day delay imposed on us when my van’s water pump had to be replaced. While I drove, The Lady pulled out the informational brochures she’d picked up in Canyonlands during her visit the previous summer. 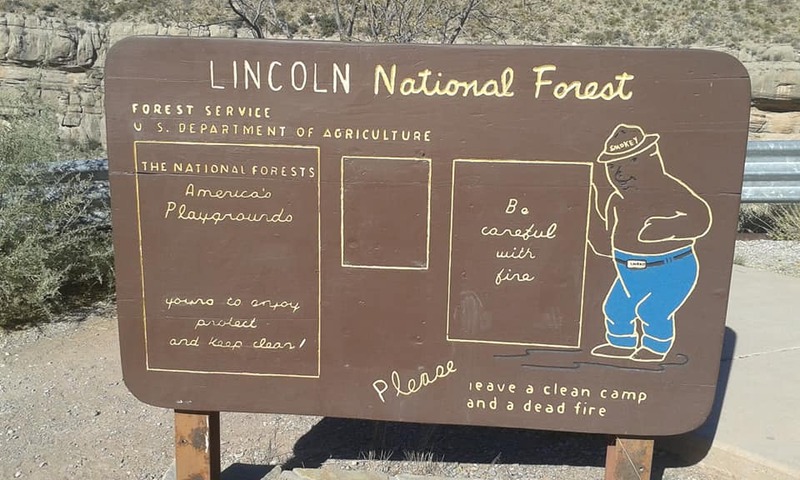 There were three campgrounds on Bureau of Land Management (BLM) land outside the boundaries of the National Park. The camping fee at each was $5 a night. That wasn’t quite as good as free, but pretty dang close. We were aiming for Creek Pasture Campground. It was the closest campground to Highway 211 (the road that would take us into the National Park), and it seemed to be big enough to offer us hope of finding an available site. We thought the trip to the campground would take us about five hours. We left Winslow, AZ early enough that we thought we’d get to the campground before dark. We had visions of cooking dinner, eating it leisurely, watching the sun set. I’m not sure what happened. We did stop to hand a can of Fix-a-Flat to a couple having tire trouble in the Navajo Nation, but that couldn’t have set us back more than 10 minutes. We stopped for one gas and bathroom break, but that took 20 minutes, tops. 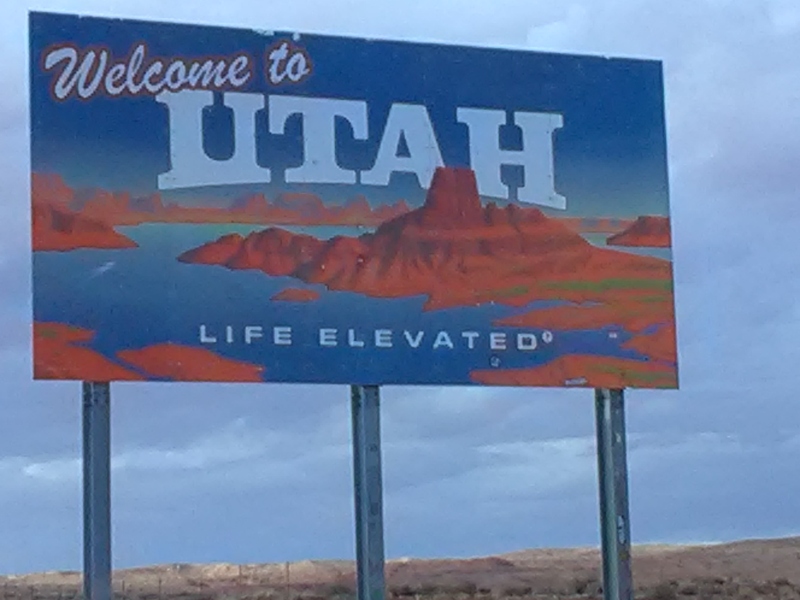 I also pulled over to take a photo of the Utah sign when we crossed the state line, but The Lady didn’t want to fight the wind, so she stayed in the van. Could my photo op have cost us more than three minutes? After we got into Utah, the sky turned overcast. It was dusk when we passed through Blanding, and dark when we went through Monticello. I was glad the GPS lady was there to tell us when to make the turn onto Highway 211; otherwise I might have missed it in the night. At some point after we turned onto the 211, the rain started. Suddenly I was driving on a twisty, turny, curvy mountain road in the dark and the rain. I really should be more scared than I am, I remember telling The Lady. 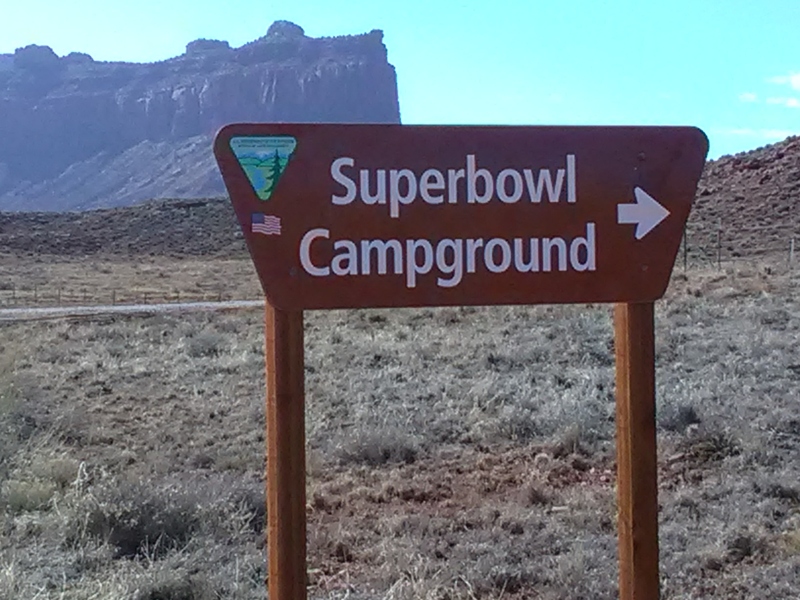 I saw the sign for Superbowl campground, but figured it would be full on a Saturday night. We hoped the larger Creek Pasture Campground would have a place for us. Maybe the rain has sent people home already, I hoped aloud. We found Creek Pasture Campground, and I drove slowly down the entrance road, then through the campground. Every campsite seemed to be taken. We saw one that appeared empty, but when I jumped out of the van to investigate, I found a tent pitched behind some vegetation. Another site appeared deserted, save for the registrations slip clipped to the pole. The departure date was the next day, and I suspected the campers had been chased off by the rain, but I had no proof. We didn’t want to risk being on someone’s site if they returned, so we decided to backtrack and check out Superbowl. We turned onto the main road into the campground and followed it to its first offshoot. We turned down that road. Immediately to our right was a campsite. There was no car parked there, no tent pitched in the bushes, no registrations slip on the pole—in fact, no pole. I pulled the van right in, and we let relief wash over us. We had a legal place to stay for the night. The rain continued, so we didn’t get out of the van to cook dinner. We just ate snacks and laughed a lot, as if we were at a slumber party. I fell asleep and didn’t hear another sound, but The Lady said it rained all night. Sunday dawned clear and sunny. As much as I hate driving in the dark, I love arriving in the dark and waking up to the surprise of beautiful scenery. I hadn’t had that pleasure since boondocking at Indian Bread Rocks in Arizona more than a year before, but we really lucked out at Superbowl Campground. I couldn’t stop oohing and aahing when I stepped from the van. Of course, my photos don’t do justice to how our surrounding really looked. The rocks were red and huge and the formations so very Utah. Even the walk to the pit toilet was wonderful in such a beautiful location. There was a sign on the information board saying the campground had been under renovation. That probably explained the brand-spanking-new fire ring and picnic table on our site. The renovations maybe also explained why the campground seemed bigger than 17 sites. Maybe it had been expanded as well as renovated. There was only one pit toilet serving the entire campground, so there was a bit of a wait to use it, but it was decently clean on Sunday morning. There was toilet paper available, which is always a plus. The campground didn’t have a camp host, but someone was servicing that restroom. The Lady and I took a brisk walk around Superbowl so I could try to get some good photos. As we walked around, we saw other campers cooking breakfast, packing up, and generally starting their days. Lots of campers looked young and athletic. I saw helmets in the bed of a truck, making me think the campers on that site were a group of rock climbers. I know practically nothing about rock climbing, but even I could see it would be exhilarating to climb any of the surrounding formations. All in all, Superbowl campground was peaceful and surrounded by beauty. I was not upset to drop into the iron ranger the envelope with our $5 camping fee enclosed. The Man and I found ourselves in Roswell, NM. When he mentioned he’d never visited Carlsbad Caverns, I said we had to go. I’d been once before, six years ago, with my boyfriend who turned out to be not very nice. Carlsbad Caverns changed me in ways I cannot describe because I can barely understand it all myself. When I realized we were less than 100 miles from a natural wonder The Man hadn’t experienced, I insisted we go. 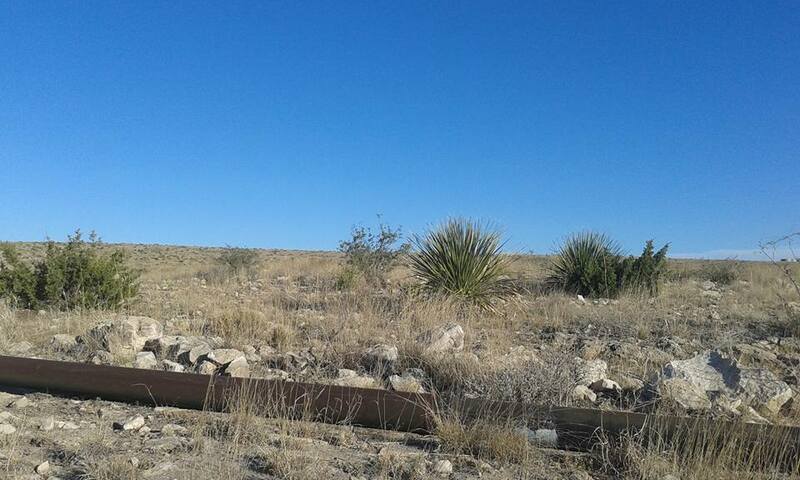 As soon as we decided to visit Carlsbad Caverns, I got on the FreeCampsites website to try to find us a nice, free place to spend the night. When my ex and I visited the National Park, we spent the night before our adventure in the parking lot of the Wal-Mart in the town of Carlsbad. I didn’t want to do that if we could help it. First, I haven’t met a Wal-Mart parking lot that wasn’t hot, noisy, and too bright. Why spend the night in a parking lot if we could be out in nature instead? Also, the town of Carlsbad is about 20 miles from the famous caverns, meaning we’d have to start the day with a half hour of driving if we stayed in town. Better, I thought, to drive in the evening and park for the night in a quiet, dark, natural spot. 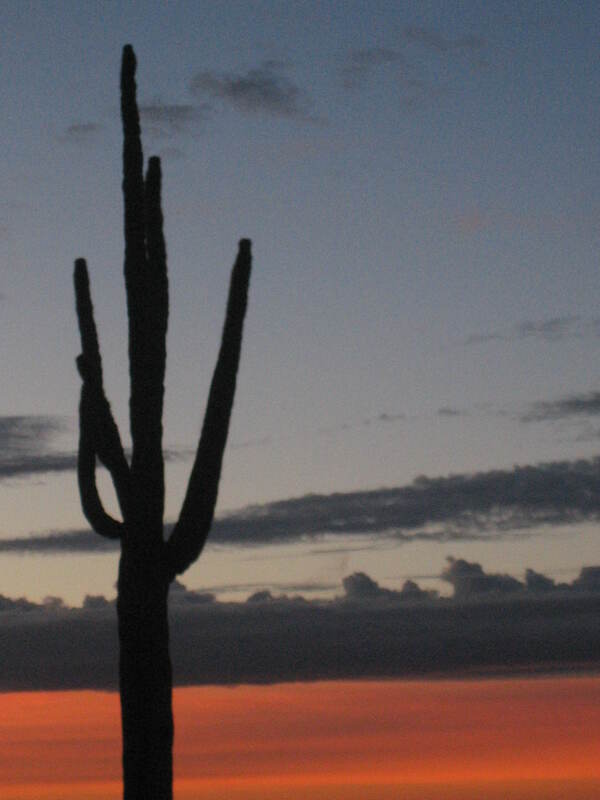 I used the FreeCampsites.net free app on my Android phone to search for promising camping areas. When I decided on the spot where I wanted to camp, I clicked on the “Get Directions” link on the page with the information about the camping area. This link is near the GPS coordinates for the site. When I clicked the “Get Directions” link, it opened up Google Maps which told me how to get from my location to the road where I wanted to camp. The Man taught me it’s better to click the “Get Directions” link than to put in the GPS coordinates myself because I might make a mistake transferring all those numbers. Once Google Maps opened, we let the spokesmodel (I named her Mildred Antwerp) guide us into our spot for the night. Without Mildred Antwerp to talk us through, it would have been a bit difficult to find the place. I would have had to keep a close eye on my odometer in order to figure out where to turn because the road onto the BLM land not only doesn’t have a street sign, it doesn’t have a name! Google Maps just calls it “Unnamed Road.” There wasn’t even a sign announcing we were on BLM land. When directed to, we turned off US-180 W/US-62 W onto a fairly well-maintained dirt road. The road was bumpy, but I’ve certainly been on worse New Mexico roads. I didn’t feel as if the van was in any danger. It wasn’t long before we saw a pull-off–a wide dirt area–on the left side of the road. Farther ahead, we saw other vehicles parked on the left. As indicated in the description of the camping area, we saw a fire ring in the pull-off, not BLM issue as far as I could tell, simply local stones someone had gathered and arranged in a circle. We knew we had arrived. This pipe snaked on the right side of the road, across from the free camping area. We didn’t want to park in the first open spot because we like privacy when we can get it, so we continued up the gently climbing road. As we went up and saw other people parked in pull-offs, I worried there might not be a place for us. All of the camping spots were on the left side of the road. On the right side, I saw a thick, dark pipe snaking across the land. 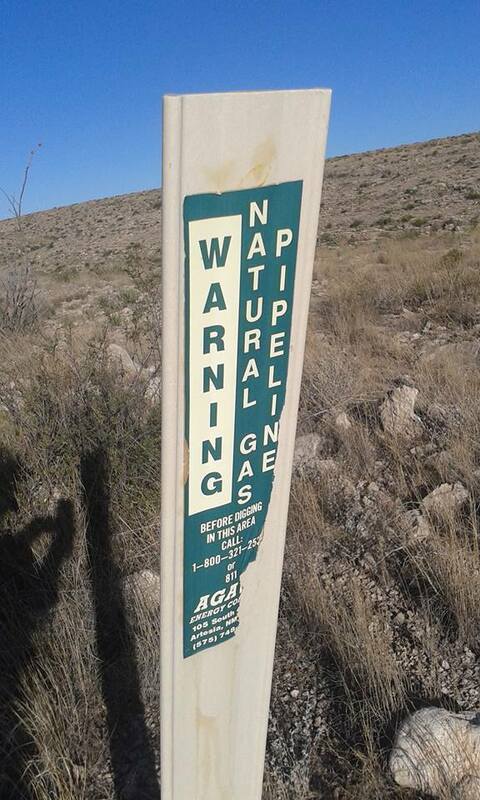 Once we stopped, I was able to read a signpost near the pipe: natural gas. The government owns the land, and somebody’s making money from the sale of the natural gas being pumped out, so I guess the least they can do is let the people camp there for free. We found a spot, the first unoccupied one past an old pickup with a slide-in camper. The Man backed in the van next to our stone fire ring. We hadn’t brought any wood and there wasn’t any lying around to gather, so we didn’t have a fire that night. We did, however, have a nice view from the back doors. We were quite far from our nearest neighbor, and we didn’t hear any noise other campers might have made. We were also quite far from the highway and didn’t hear any sounds of traffic. The whole time we were there, only two vehicles passed our camp. Soon after we arrived, a truck drove up the road and not too long after, drove down the road and away. In the morning, a woman who must have been camped above us drove past the van as she left. Otherwise, it was easy to imagine we were the only people in the area. 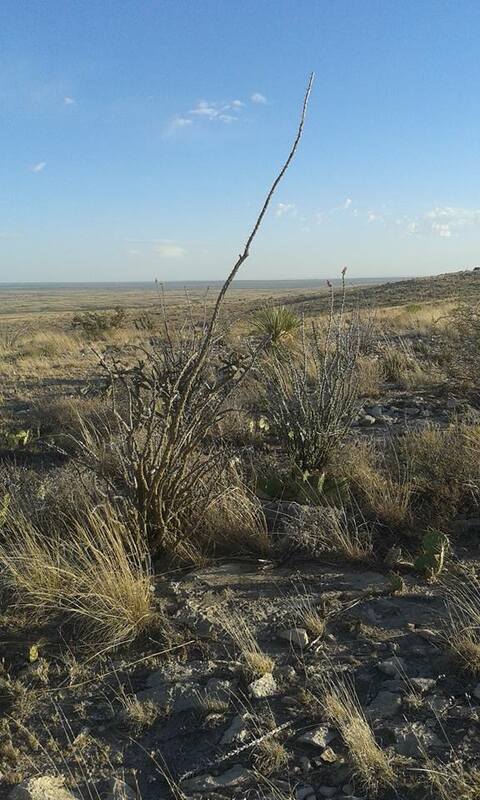 Staying on this BLM land was a true boondocking experience. There was no water, potable or otherwise. There were no toilets of either the pit, the flush, or the portable variety. There were no garbage cans or electricity. It was totally a case of bring in everything you need and take out all the waste you produce. The fire rings were the only indication people had camped there before. I did have service for my Net 10 phone the entire time we were on the BLM land. I was even able to post a picture to Facebook and view updates from friends. I’ve stayed in prettier free camping spots, but this place was not completely lacking beauty. 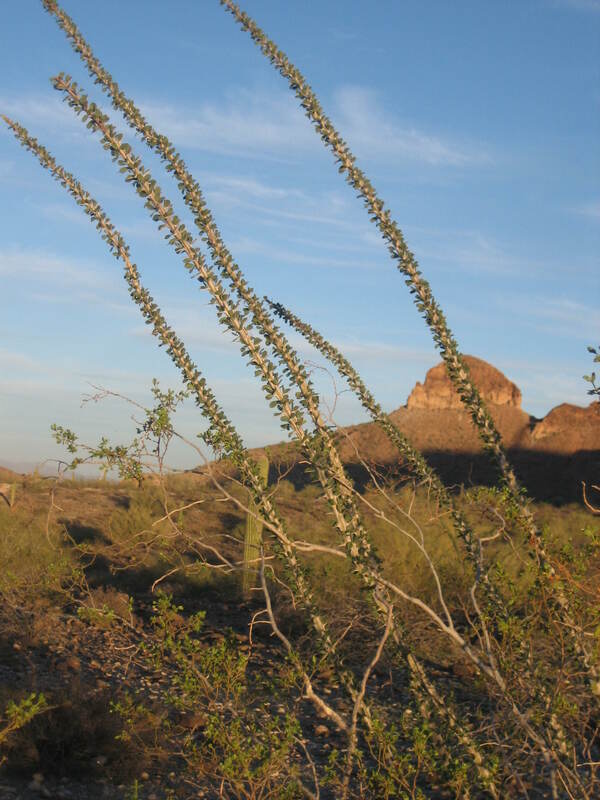 We were in a sort of deserty area with clusters of grass, small cacti, and ocotillo plants growing from rocky ground. Below us, flat land with no trees stretched as far as my eyes could see. What the area lacked in beauty, it made up for in silence and darkness. It was also in a great location. In the morning we woke up, ate our cereal and milk, then drove about five miles to the entrance of Carlsbad Caverns National Park. Spending the night on this BLM land beat staying in the Carlsbad Wal-Mart’s parking lot on every count. 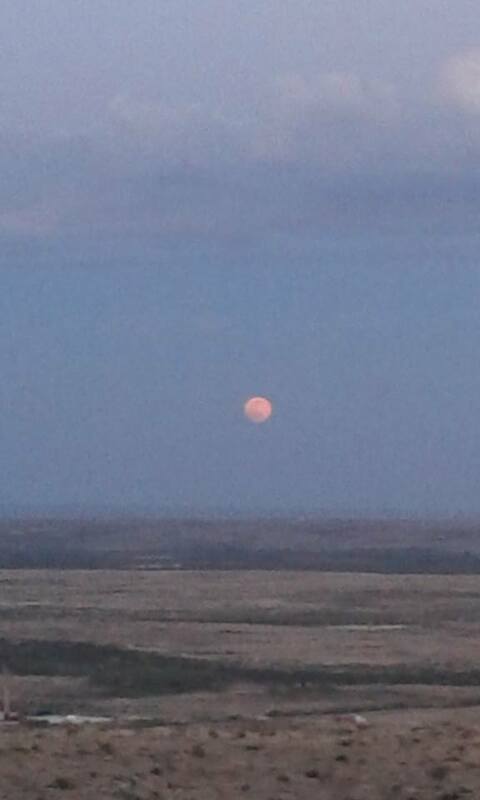 The night we stayed on the BLM land, we were blessed with a red moon above us. Last week my friend and I walked around the desert, looking for a place to make a good camp on BLM (Bureau of Land Management) land. While we were walking around, I took photos of some of the things I saw. 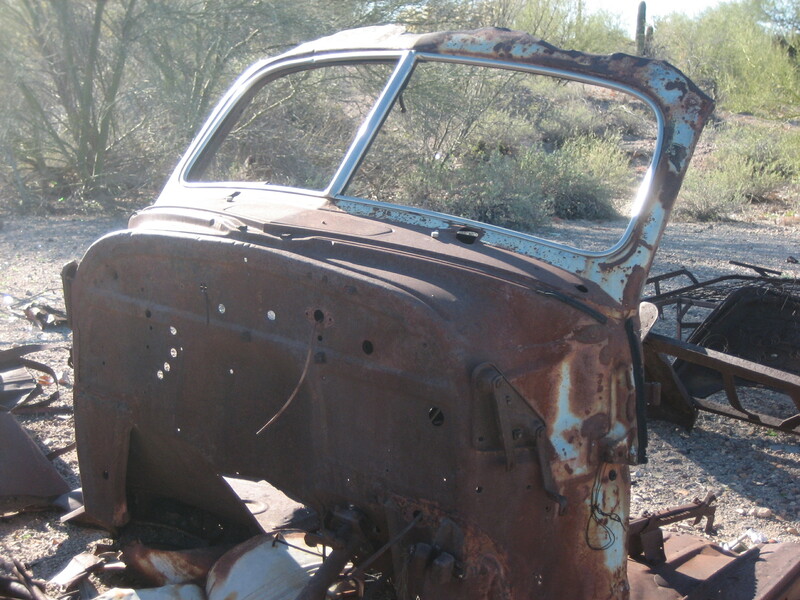 This photo shows the old car we found in the wash. It’s very rusty. 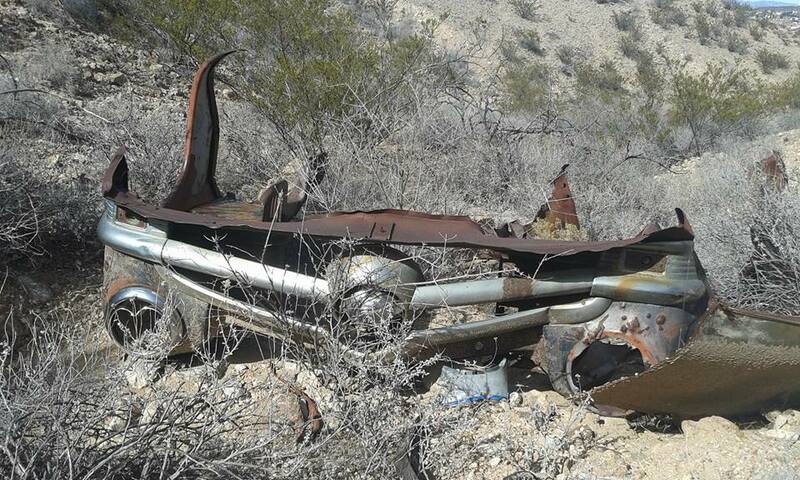 The most unusual thing we saw was the rusted remains of an old automobile. Believe me, the car was not in a place it could have easily been driven to. In fact, it was in a place that seemed impossible to drive to. It was high up in a wash, in a place I think no motorized vehicle could go. How do you think that car got here? I asked my friend. I think it was washed here in a flood! I said. How else could it have gotten here? The car seemed old, not just because it was rusty. The design of the car seemed old. I think the car had been sitting there for years, decades even. I don’t think anyone is going to drag the car out of the wash. I think the car is going to sit there until it becomes one with the earth. This is the front of the car we found in the wash. It looks really old to me. Wow! Look at that bug! I said when I saw a beetle sunning itself on a small rock. I like to see creatures hanging out in nature. We poked at the beetle a little, just to see it move, then we felt bad about disturbing it. It tried to hide in the shadow of the surrounding rocks. I tried to move it back to the sun where I’d first found it. Later, I almost stepped on it as I skidded down from a higher level where I’d climbed. Watch out for our little friend, my friend said to me, but I thought he was talking about the dog. 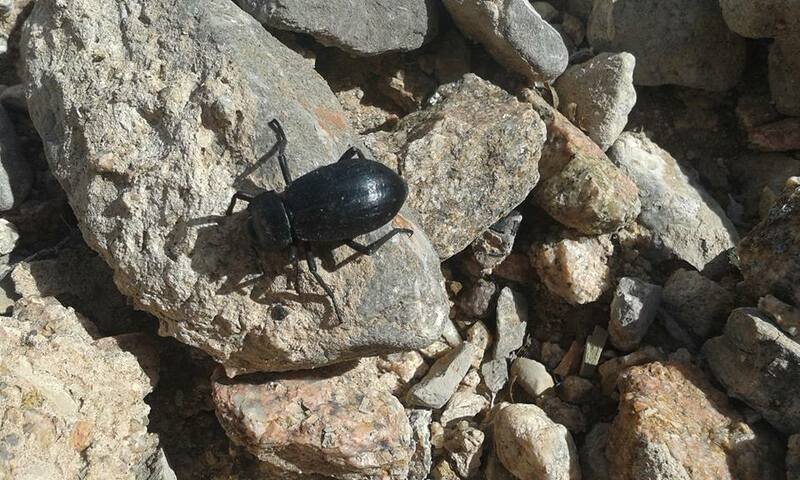 Luckily, I didn’t step on the beetle, although I was pretty out of control at the moment, waving my arms and trying to get down the steep, rocky incline without falling. I stood at the base of it and looked at the openings in the rock. I think it was full of packrat nests. I saw what I thought was feces, and got away from it fast. I don’t need any New Mexico plague, thank you very much. I think the formation was made of sandstone. It felt gritty to the touch, and seemed as if it could easily disintegrate or wash away. Although at first I thought camping up against it might make for a good campsite, we ended up deciding it was too unstable to trust with our lives. After a couple of hours of walking around, we found a spot my friend liked. It was mostly flat and mostly secluded. He set up his tent and hauled his things over while I reorganized the van. 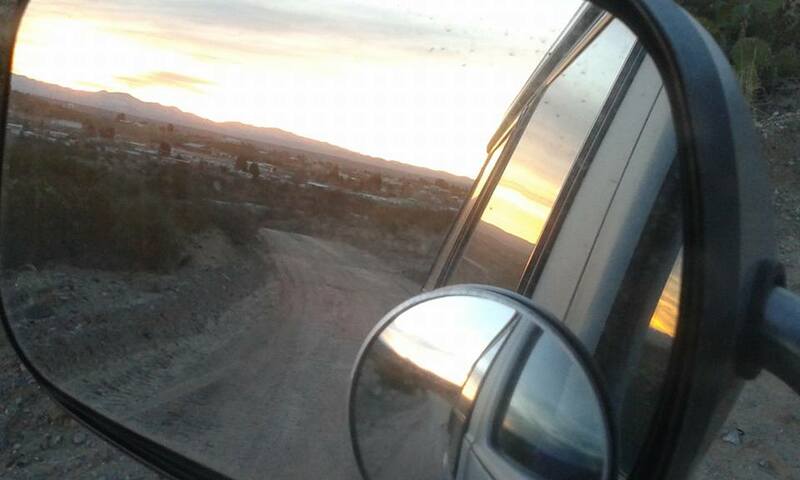 As I left in the late afternoon, I saw the sunset in my sideview mirror. 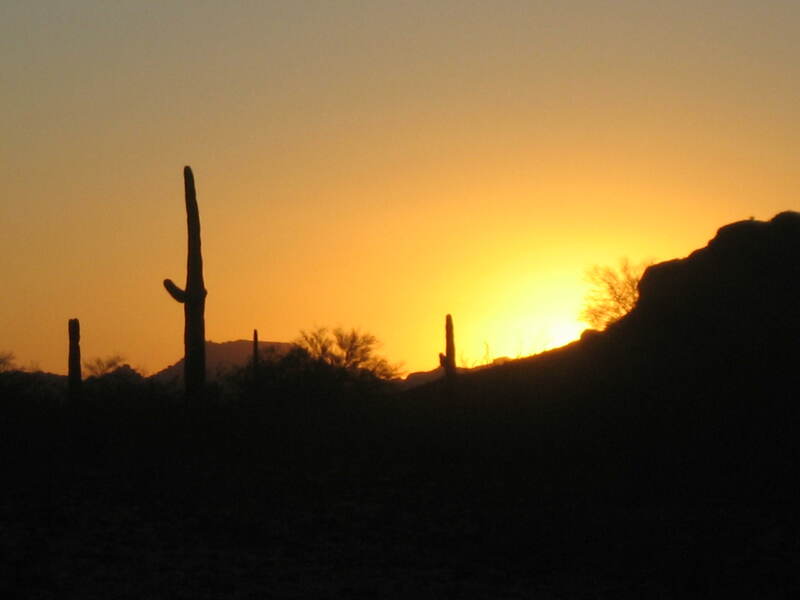 It was a lovely end to a lovely day in the desert. Before I got to Quartzsite for the Rubber Tramps Rendezvous (RTR), my new friend Iggy told me about the hikes he’d taken the year before near the site of the RTR and the abandoned (and not so abandoned) mines he’d discovered out on that BLM land. It sounded cool and interesting, and I said I wanted to see an abandoned mine too. Iggy and I went on a hike the day after we both arrived, but we had to turn around to beat the sunset before we ever got to a mine. After that, I was always too tired or too busy to go hiking with Iggy, and then the RTR ended and we went our separate ways. 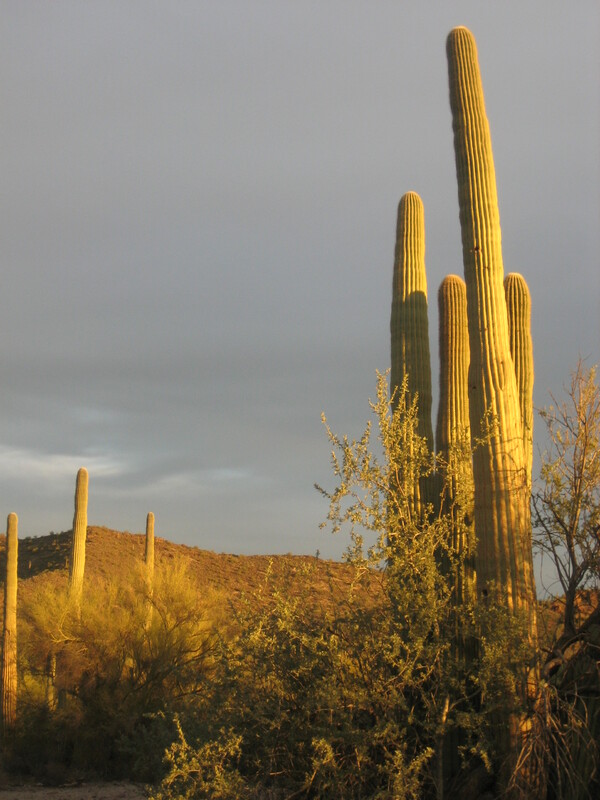 I went to Ajo, AZ next and spent a few days boondocking on the BLM land adjacent to the Ajo Scenic Loop. One morning, as I was driving down the loop, headed into town, I saw a sign that said Abandoned Mine. What? I thought about Iggy of course, so that afternoon after parking the van in my spot, I walked down the road to see the mine. 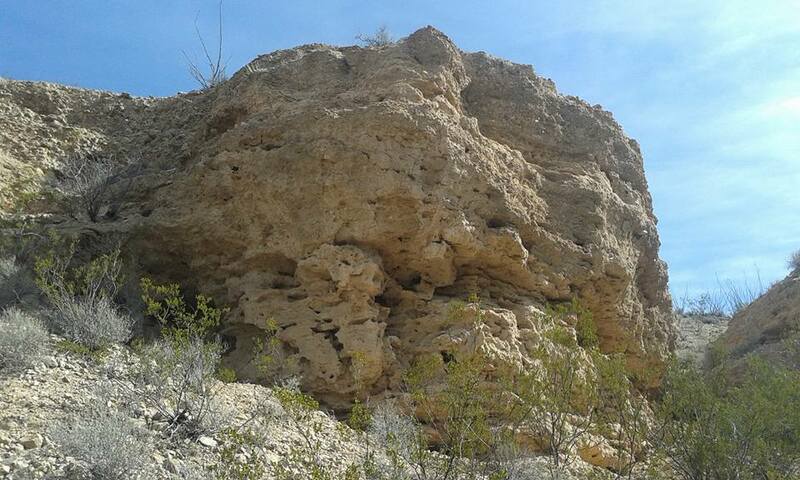 I didn’t have to hike or climb or avoid cacti to get to the mine. It was right next to the road. I took a couple of photos, and that was that. The most interesting thing I learned was that Arizona has a state mine inspector. Who knew? 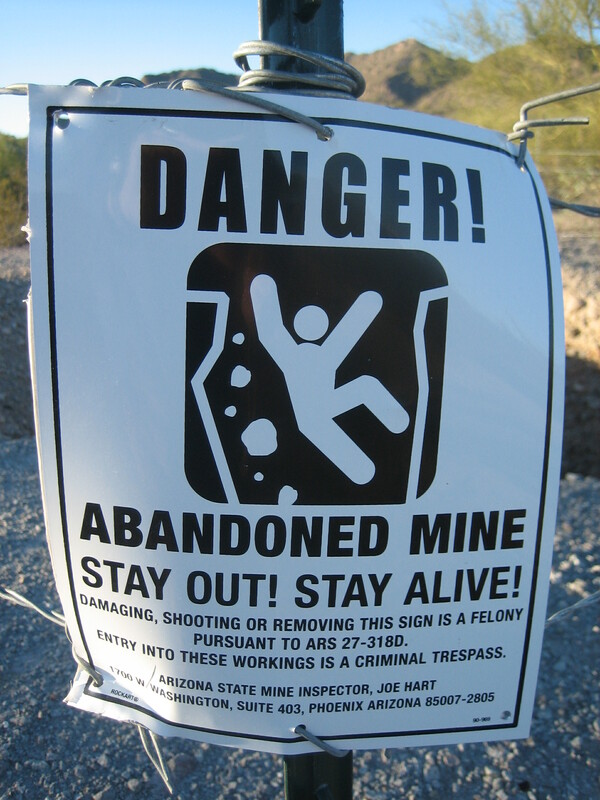 Before I wrote this post, I decided to do a quick Google search on abandoned mines on BLM land. I learned a few things on a couple of BLM webpages too. 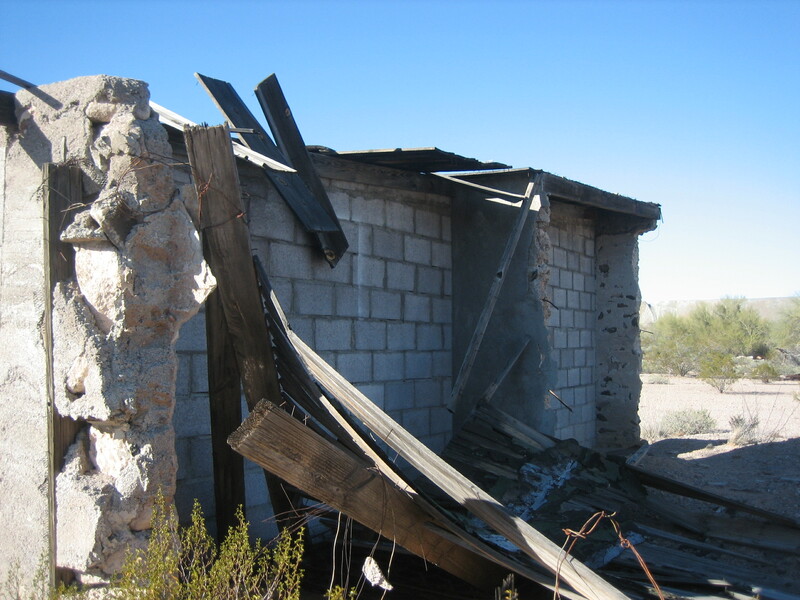 What is an abandoned mine? 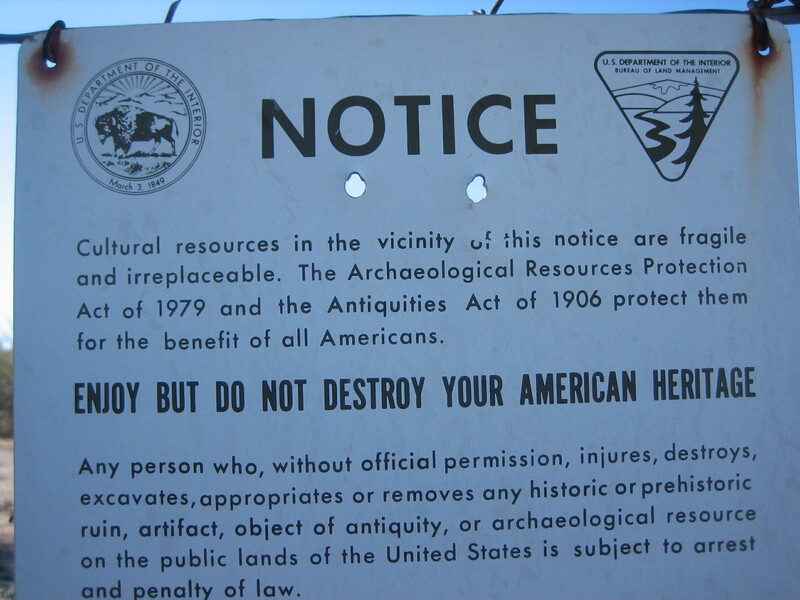 The AML [Abandoned Mine Lands] program addresses hardrock mines on or affecting public lands administered by BLM, at which exploration, development, mining, reclamation, maintenance, and inspection of facilities and equipment, and other operations ceased as of January 1, 1981…with no intention of resuming active operation. What are examples of AML hazards? 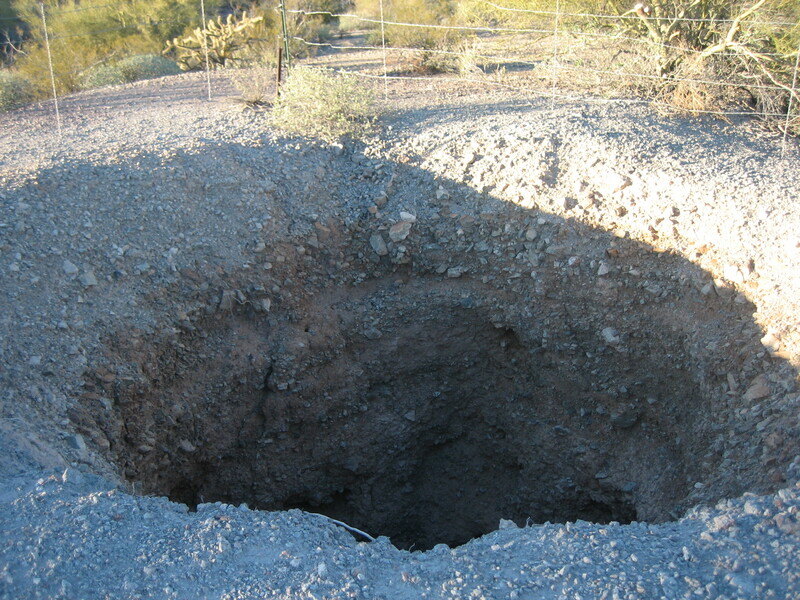 Physical hazards: Unsecured AML sites pose a risk of death or serious injury by falling down open mine shafts. Human health hazards: Exposure to toxic gases and chemicals, cave-ins, explosives, and water hazards endanger human health. Environmental hazards: Water contaminated by mine tailings threatens nearby communities and destroys habitats. Which types of sites become cleanup priorities? The decision is made on a site-by-site basis, but typically the following factors are taken into consideration when determining priorities. Cost: Have cost-effective partnerships available. What are some of the ways BLM addresses hazards at abandoned mine sites? Removing and properly disposing hazards such as mining and milling equipment, oil and chemical drums, and other debris. 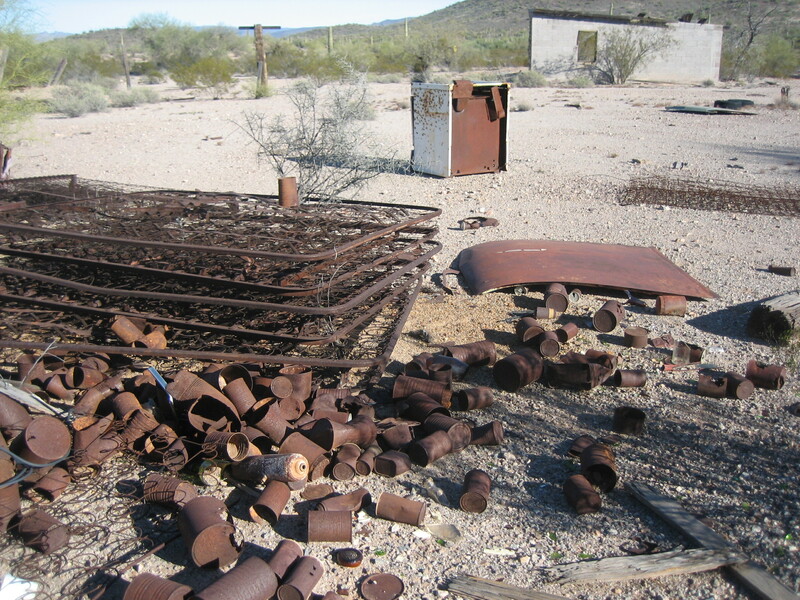 This aforementioned webpage also says that as of January 2, 2015, the number of known abandoned mine sites in Arizona was 6,229. 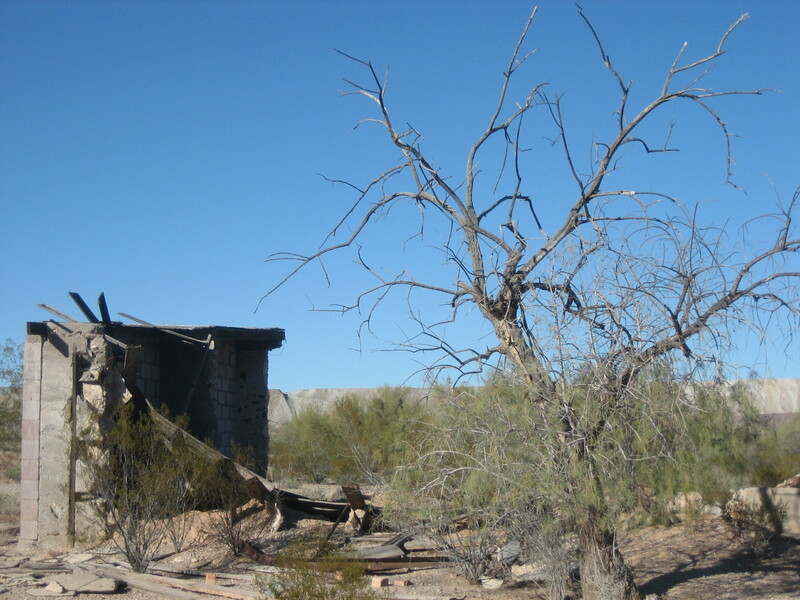 Along the Ajo Scenic Loop, I saw what appeared to be an old homestead. I interpreted this sign to mean, you can be in here, but don’t touch, damage, or destroy anything. Going west on Darby Well Road, almost to Scenic Loop Road, there was a fenced off area on the right. Although there was a fence, there weren’t any “No Trespassing” signs, and there was an opening in the fence (more like a purposefully made entrance than like a place where fencing had fallen or been pulled down) where an adult could easily walk through. Near the entrance opening, there was a sign. I interpreted this sign to mean, you can be in here, but don’t touch, damage, or destroy anything. Ok. I knew I could handle that. Junction of Darby Well Road & Scenic Loop Road. This intersection is unmarked but it is obvious. Parts of deserted buildings are on the right–this is Darby Well. I walked around and didn’t see any signs naming this place or any evidence of a well. 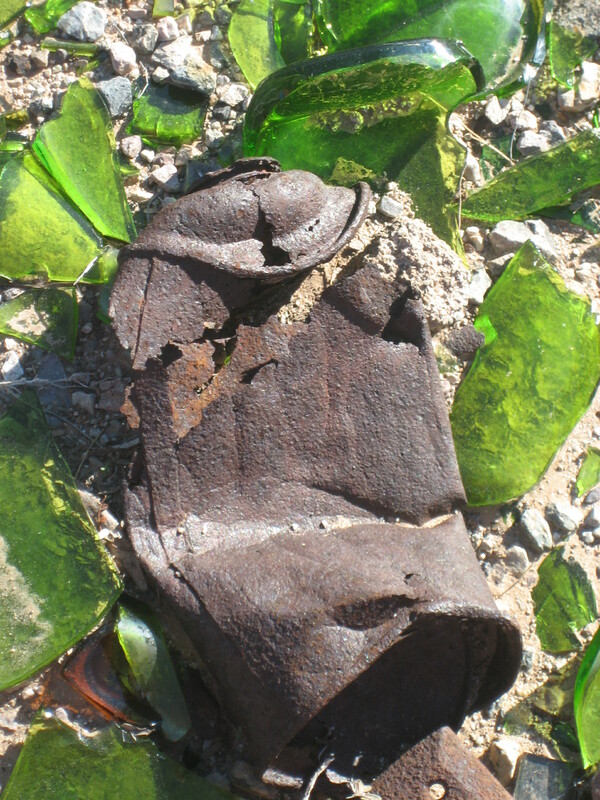 What I did see was a lot of rusty metal and a lot of broken glass, much of it green. This site looked more like a dump than a homestead. There wasn’t a trash pile, no single area where broken glass and rusty metal was heaped. Broken and rusty things were spread out all over the place. In New Mexico, people love to make “art” from rusty metal. I call this “tetanus art.” This place would have been a jackpot for a “tetanus art” artist, if all of this rusty metal had been up for grabs. It was a bit hard for me to imagine any of this junk being “fragile or irreplaceable.” I suspect I felt this way because this trash was relatively modern. I know trash can tell archaeologists a lot about a society, but because this trash didn’t look terribly old, it was easy to think there was nothing going on here more than this was a place where people who didn’t pick up after themselves lived. 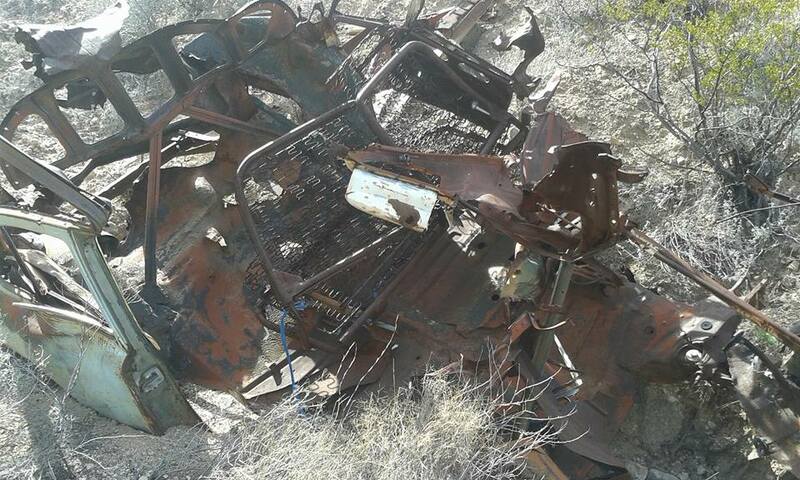 The remains of an old car (truck?) sat on the property. I thought this old automobile body was interesting. 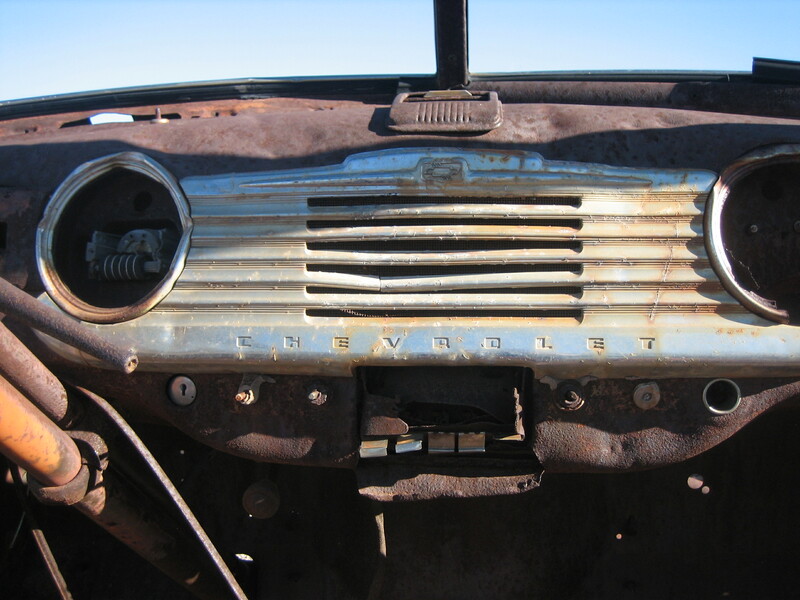 We can see from the dashboard that this vehicle was made by Chevrolet. Anyone have any ideas about the model or the year? As I do whenever I walk through abandoned places where people once lived, I wondered about the people who had lived here. Who were they? Why did they leave? Where did they go? Are they dead now? Where are their descendants? 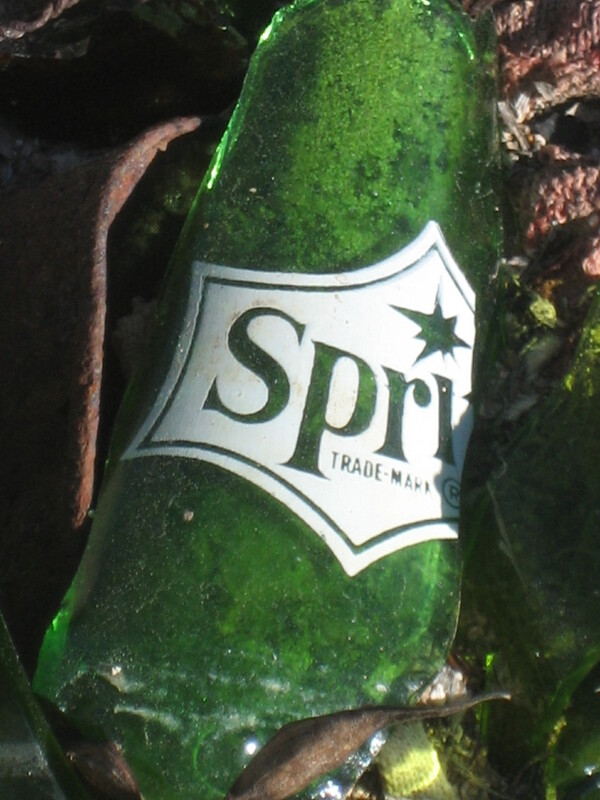 Do those descendants ever come here and look at the trash of their ancestors and think, My grandfather may have drunk from that bottle of Sprite. Did my grandmother wear that shoe? It was easy to forget–when I didn’t see or hear another human being–that this had once been a place where people lived and worked and laughed and cried and sang and cooked and loved and hated. 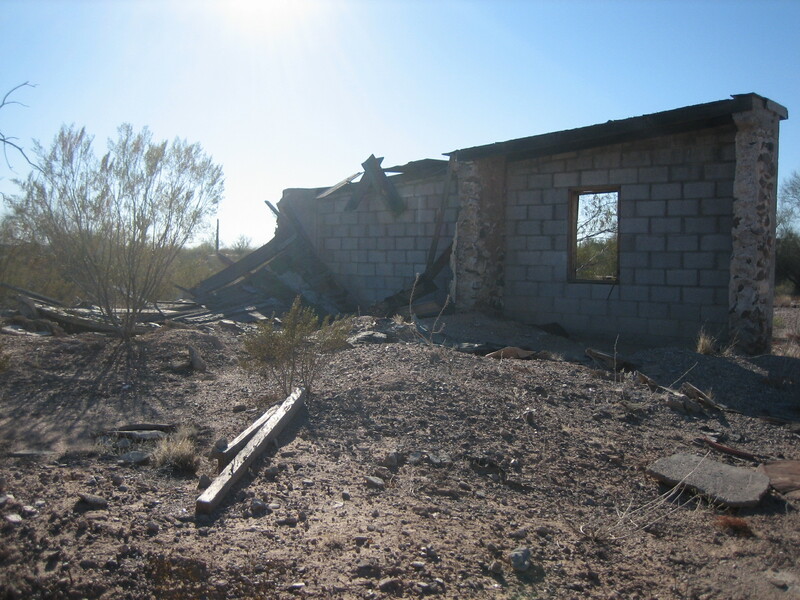 Someone built the house that was now only a wall, probably several someones, probably without power tools or other fancy equipment. What was left of the house held the sweat and probably the blood and the tears too of the people who built it and the people who lived there. Who slept on these mattress springs? Who ate the food out of these can? Who cooked on that stove? Who lived in that house? Who’d lived in that house? Had people made love there, birthed babies there, died there? Who’d cooked dinner on the stove now sitting in the sand, slept in a bed whose springs were now abandoned and rusty, awoken in this place each morning? How much longer will the house stand before nature reclaims the land? Nature wants to reclaim the land. 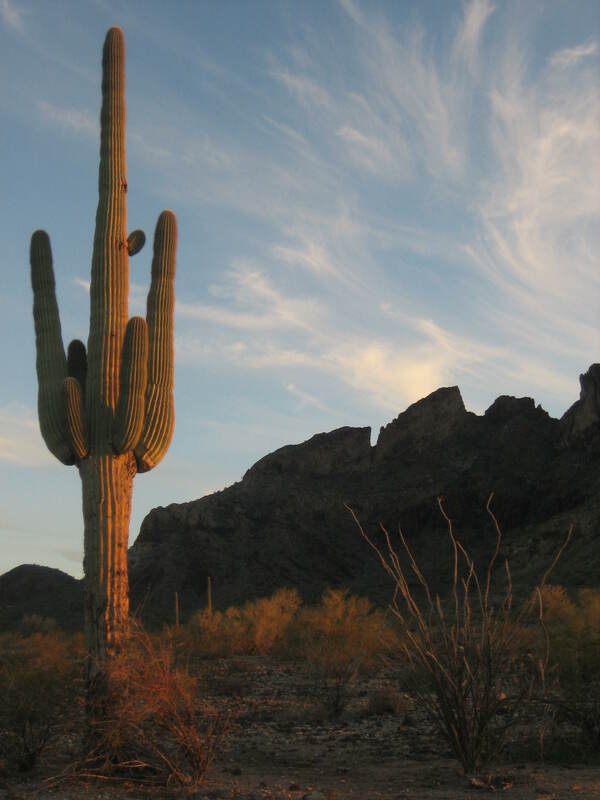 When Coyote Sue told me about Ajo, I was excited to hear there was plenty of free camping on BLM land right outside of town. 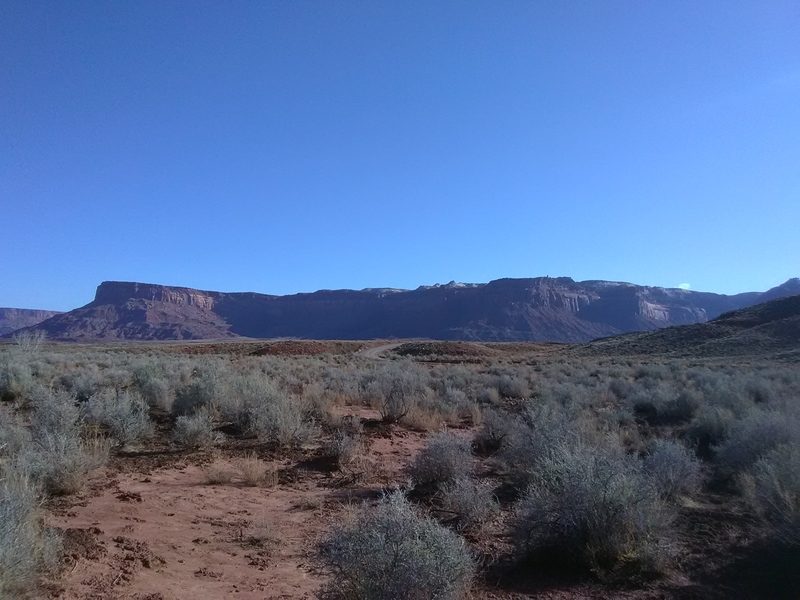 Between what Sue told me about Darby Well Road and the brief write up on the Free Campsites website, I found the BLM land with little problem. 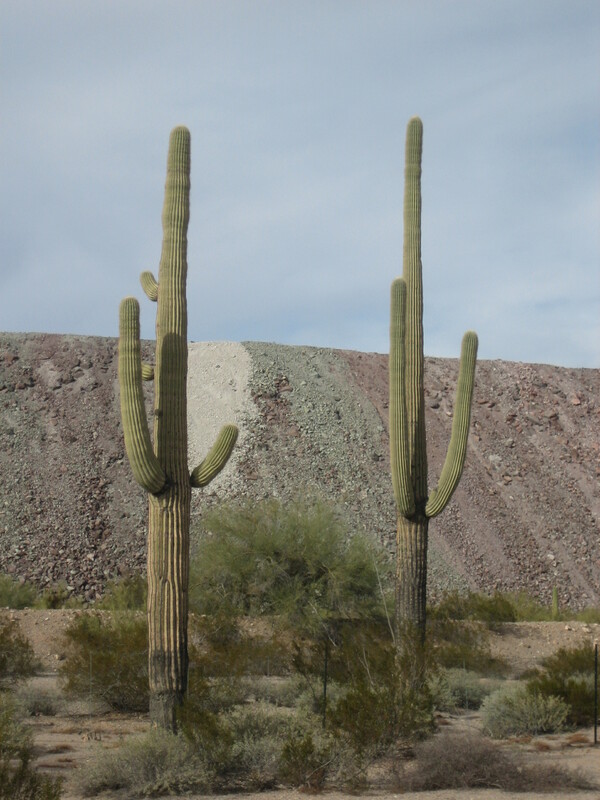 Beyond these two saguaros, one can see the giant wall of earth. Beyond the wall of earth is the New Cornelia Mine. 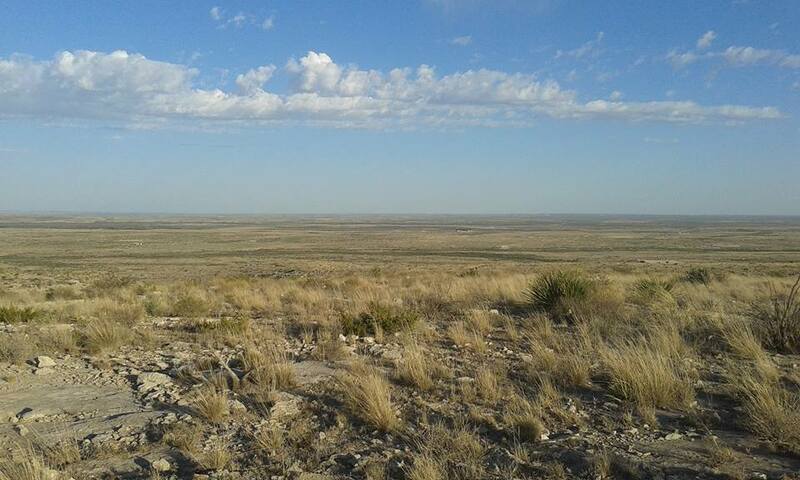 Freeport-McMoRan owns the land across from the BLM land. Freeport-McMoRan’s land is fenced off, with “no trespassing” signs affixed to the fence. Beyond the fence, are massive walls of earth. Beyond the walls of earth is the New Cornelia Mine. 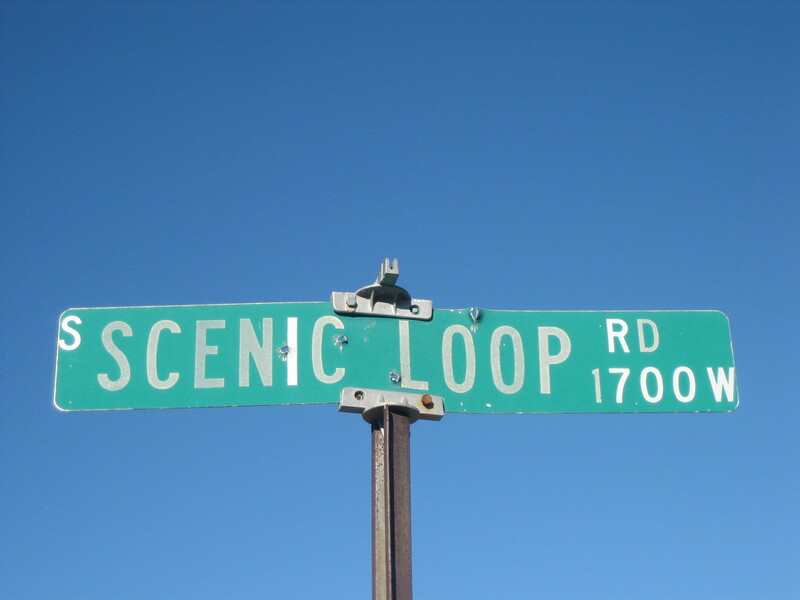 Later, when I read the brochure for the Ajo Scenic Loop, I realized that Darby Well Road is part of that picturesque 10 mile drive. This photo shows the view I had when I opened the side doors of the van. 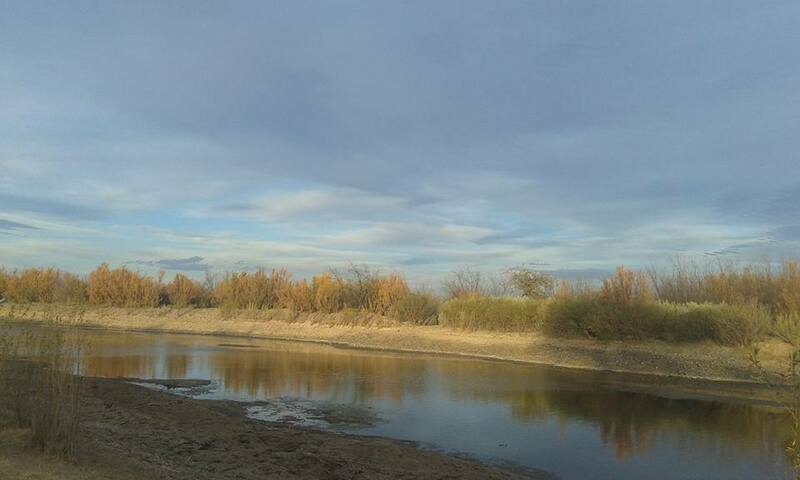 The first couple of nights I stayed in the area, I kept my camp fairly close to Highway 85. On the third day, I drove the whole Scenic Loop and saw how much public land was available for camping. From that night on, I parked the van in a spot where I was surrounded by nature. At the intersection of Darby Well Road and Scenic Loop Road is a sign warning people that smuggling and illegal immigration may happen in the area. I didn’t see anything that even vaguely resembled smuggling or illegal immigration, although I did see Border Patrol trucks zooming way too fast down Darby Well Road. The only other people I saw were boondocking on the BLM land. 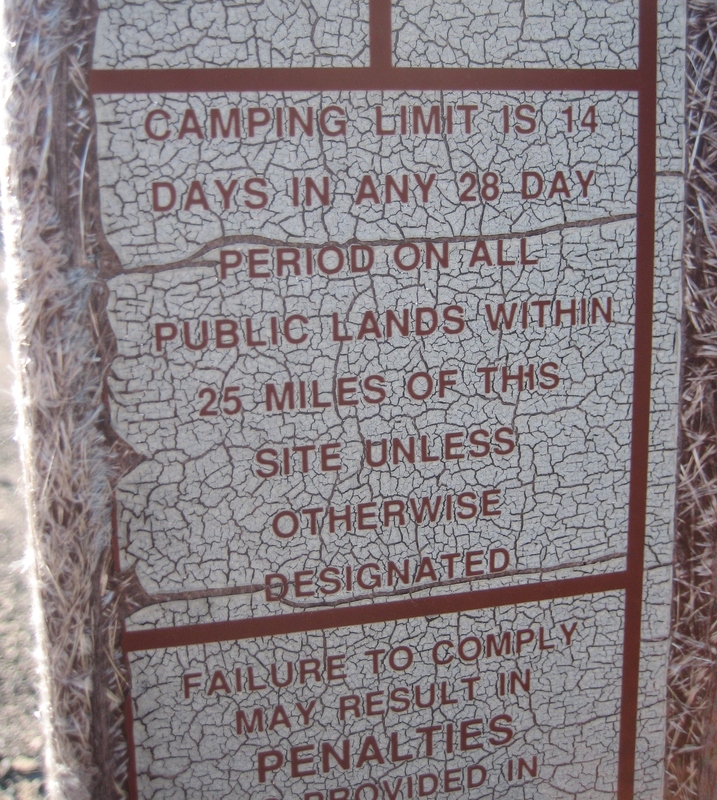 Like on most BLM land, there is a 14 day camping limit here. However, there was no camp host in the area, and no permit was required for camping. I did not see any BLM employee during the time I spent in there. Camping in the Darby Well/Scenic Loop area is definitely primitive. There’s no running water, no drinking water, no picnic tables, no shade structures, no trash cans, no dumpsters, no showers, and no pit toilets. Nothing is provided and anything packed-in certainly needs to be packed-out. This was the view from the other side of my van. 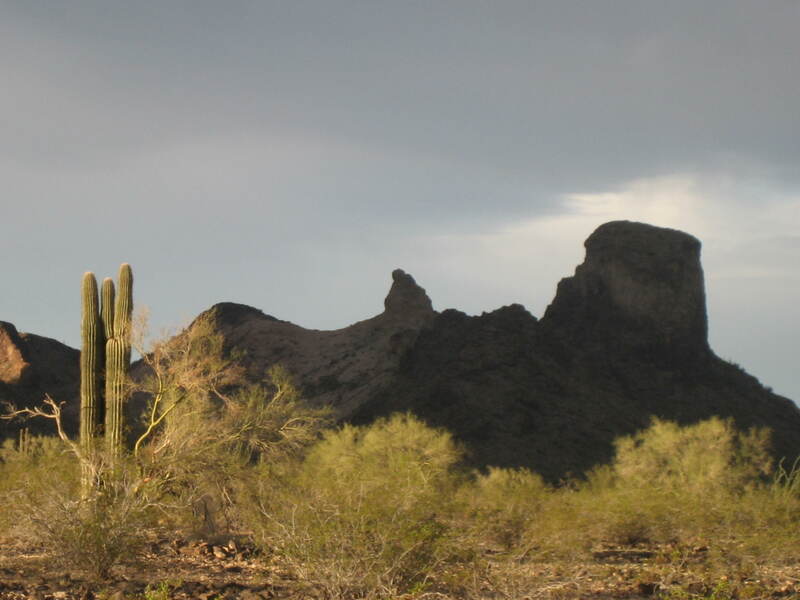 What I liked best about camping on this BLM land is that even though Ajo is just a couple of miles away, I couldn’t hear the low roar of vehicular traffic in the distance. I couldn’t see the lights of the town. The only signs of civilization I saw were the RVs belonging to the other folks camping out and the occasional automobile tooling along Scenic Loop Road. 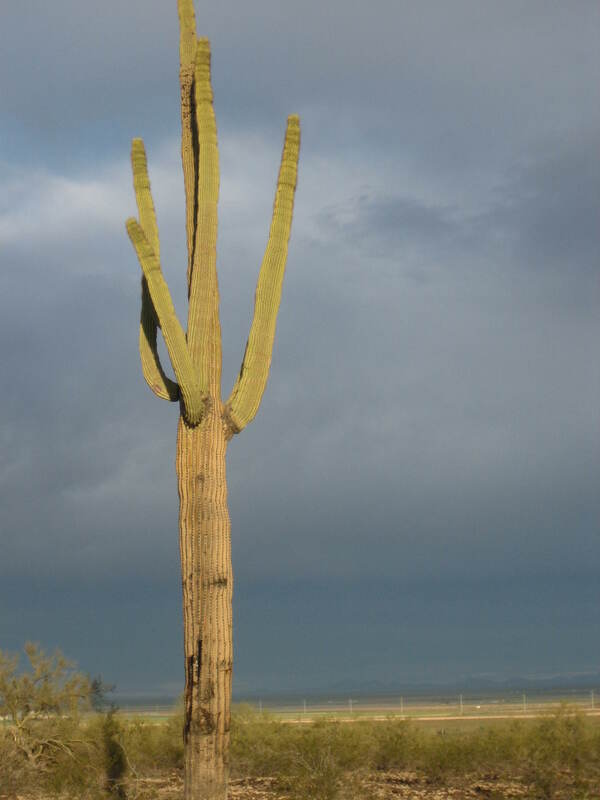 This organ pipe cactus is visible from the Ajo Scenic Loop. 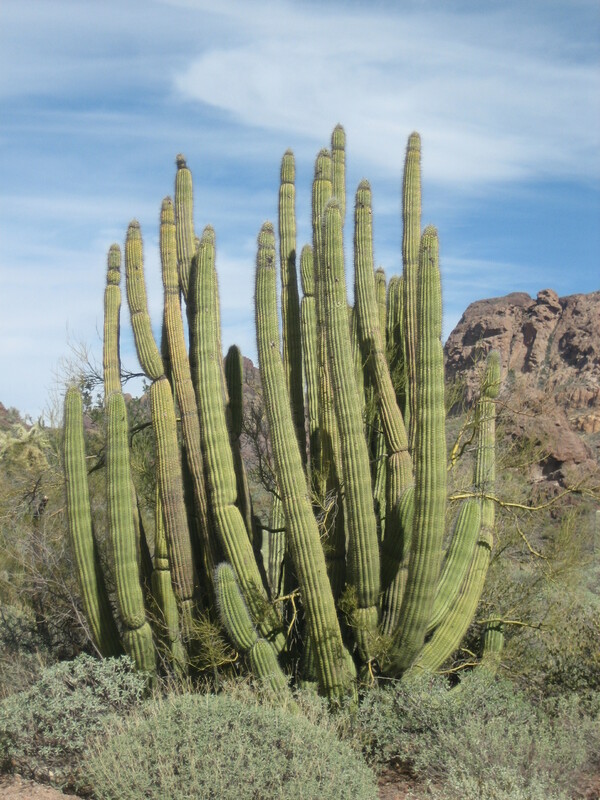 Essentially all Sonoran Desert plants, for this elevation, are readily spotted on this easy self guided tour. 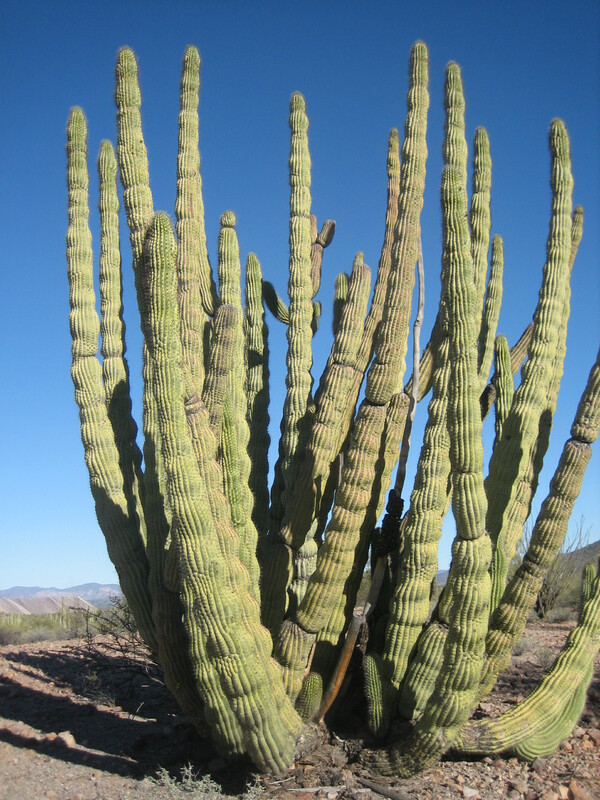 Many say there are more Organ Pipe Cacti here than in the Organ Pipe Cactus National Monument. 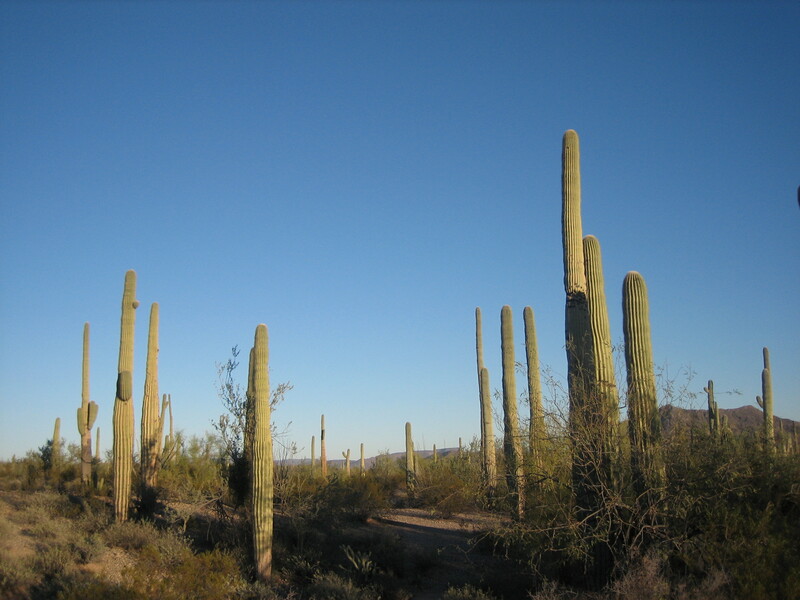 Saguaro, Organ Pipe, Hedgehog, Barrel, Prickly Pear and Cholla Cacti, Ocotillo and Jojoba, Mesquite, Iron Wood, Palo Verde and Elephant Trees, Fairy Duster and Brittlebush all are well represented or in abundance as are many more desert varieties. 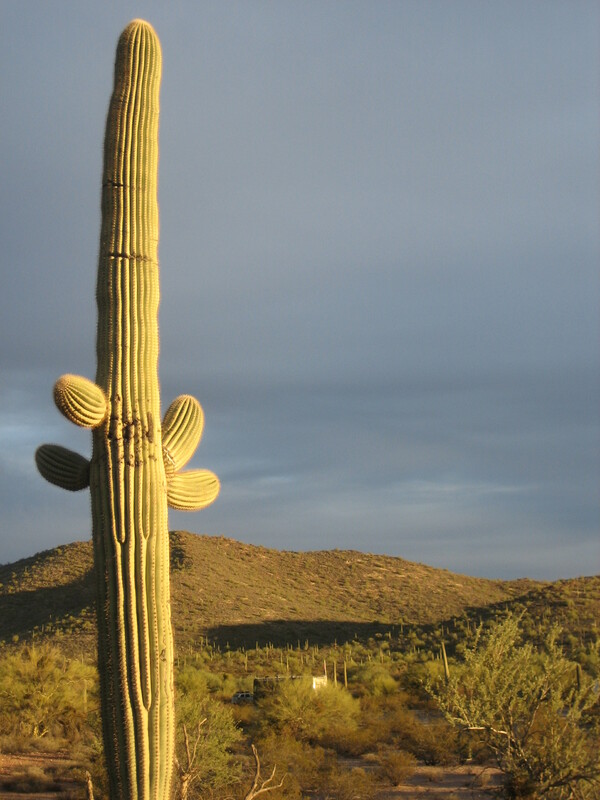 Saguaro in the afternoon light. 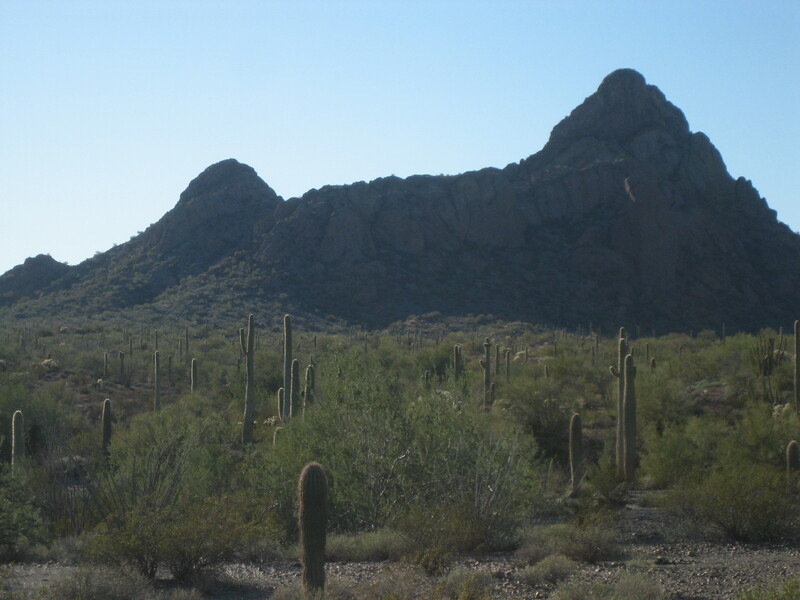 The BLM land on the Ajo Scenic Loop is definitely one of my favorite places to boondock. It’s quiet, it’s dark at night, and the scenery is fantastic! I first heard about the Saddle Mountain BLM (Bureau of Land Management) land at the 2015 Rubber Tramp Rendezvous. I ran into a guy I’d previously met in New Mexico, and he told me about the BLM land surrounding Saddle Mountain, but I didn’t make it out there before I set out for my summer job. 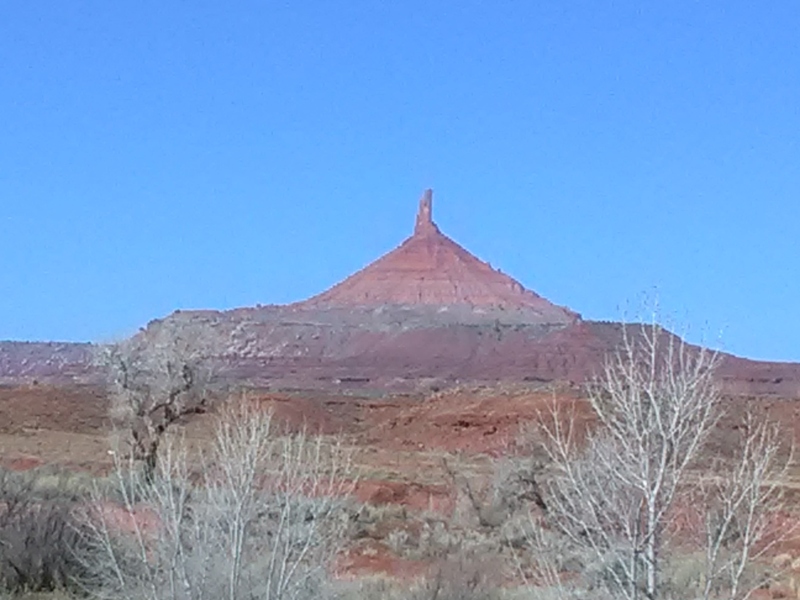 In early winter 2016, my friend Coyote Sue took a trip to the area, and I decided I REALLY wanted to go there. One reason I hadn’t gone sooner was because I didn’t have very good directions. The guy who first told me about the place pointed to it on an old Arizona map, but he wasn’t able to tell me what roads to take. I was a little worried about going out there and getting myself lost. 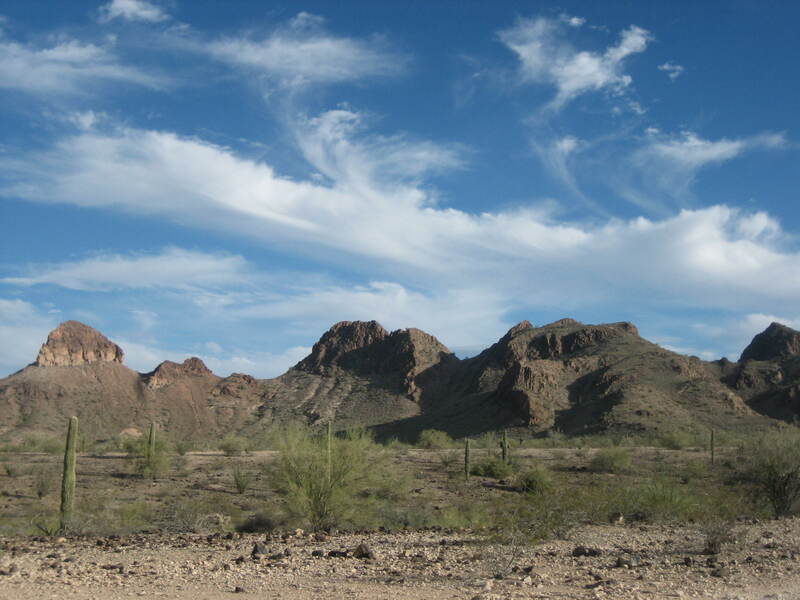 Before I set out on my trip, I did some research by searching “saddle mountain free camping Arizona” on Google. I got a hit on the Free Campsites website. I’ll just go ahead and give directions so nobody has to do all that work him/her self. From Interstate 10 in Arizona, take exit 94 toward Tonapah. Turn left onto 411th Avenue. Keep going south for almost three miles, passing Osborn Road and the Saddle Mountain RV Park. You’ll get to a T in the road. Turn right onto West Salome Highway. (If you go left, you will end up in Buckeye, AZ.) Drive for 5.2 miles, then turn left onto Courthouse Road. Both West Salome Highway and West Courthouse Road are paved and both have official street signs. 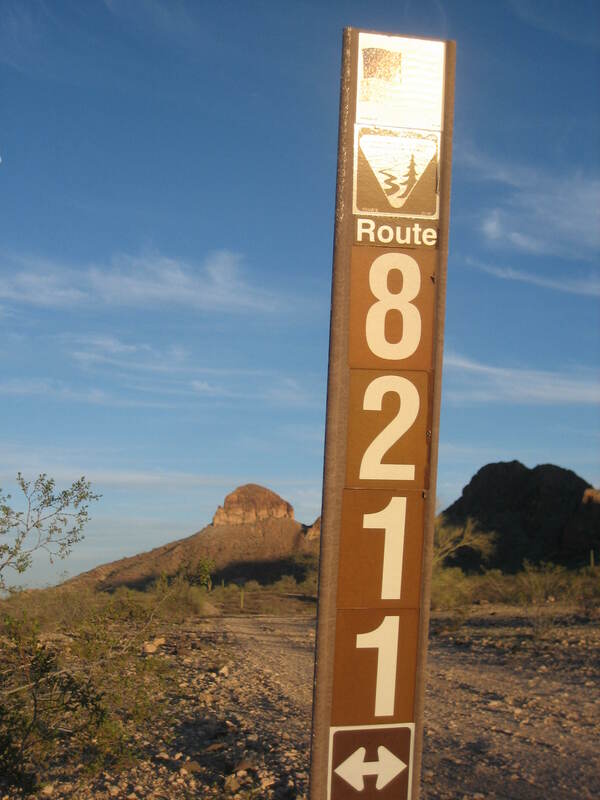 After 1.8 miles on West Courthouse Road, turn left onto the Saddle Mountain BLM land. Like a dumbass, I had not written down the distances I was supposed to go on each road. I found Salome Highway easy enough (411th Avenue ends, go left or right, no big deal), but I’d gotten a little worried after a couple of miles that Courthouse Road wasn’t signed, and I’d missed it. I kept going, then saw the sign for Courthouse Road and breathed a sigh of relief. I wasn’t lost. However, because I didn’t know how far I was supposed to go on that road and my last direction was simply “turn left,” I didn’t know where to turn onto BLM land. I drove slowly and kept an eye to the left, hoping to see a sign. I didn’t see a sign, but I did see a kiosk. 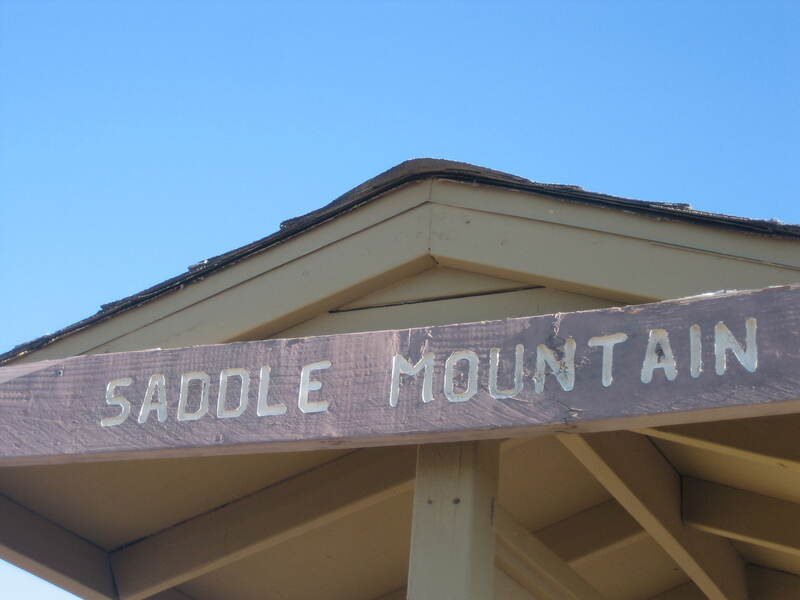 Although I couldn’t read the words Saddle Mountain on the top of the kiosk, I suspected I was in the right place and turned down the road. When I got closer and read the words up there, I knew I’d made it. I drove south on the road, which I later found out is Route 8211. This road is not paved, but is what I would describe as a “good” dirt road. My conversion van had no trouble getting down it. As I drove down Route 8211, I saw one RV, an older, medium size motor home which was about to pull out of its spot. The people in it waved to me as I drove by. During the time I was there (Wednesday afternoon to Saturday morning), I didn’t see any other folks camping in the area. As I was trying to find a spot, I realized I could see bits of civilization to the north. Sure, I wasn’t looking at a metro area, but I could see vehicles (including many 18-wheelers) driving past on I-10. I could also see a couple of large industrial operations between my location and the interstate. I decided to park the van so my side doors opened to the south, which offered a view of mountains and cacti, not the trappings of humanity. 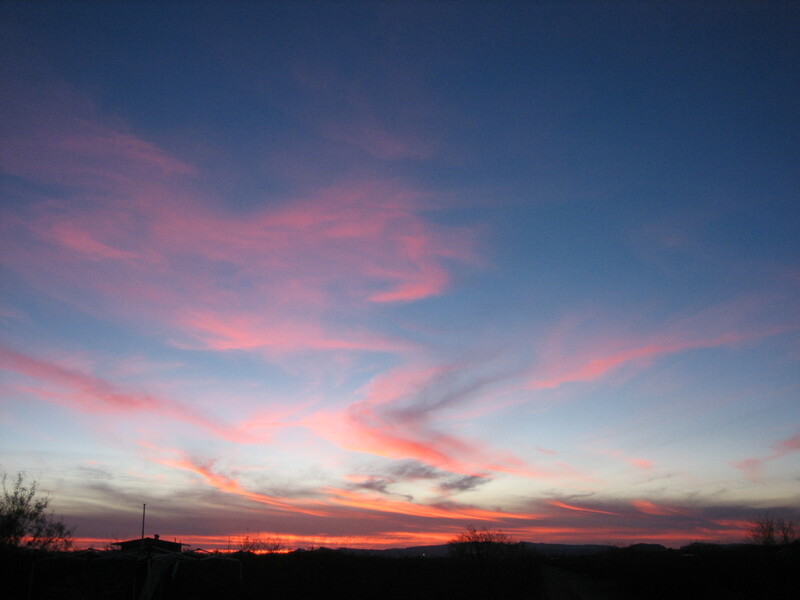 Once the sun went down, I could see a good number of ligths to the north and the northeast, which also detracted from the sense of being alone in the wilderness. Sure, Saddle Mountain is well out of the city, but I didn’t feel as if I were in the middle of nowhere. That situation might have been remedied if I had driven farther down Route 8211. On Friday evening, I went for a walk to the south on that road and found many other places where folks had obviously boondocked before. There were plenty of flat spots to park a rig, and I saw fire rings made from rocks obviously gathered in the area. I didn’t move the van; I was much too lazy for that. However, next time I stay there, I will drive to the end of the road and try to find a place where I can’t see one bit of civilization. Although I could see vehicles on the interstate, thankfully, I couldn’t hear them. I didn’t hear much human noise out there. The sound of a car engine passing on the road in front of the van did wake me up on Wednesday night. When I looked at my watch, I saw it was 11:30. I thought it was a weird time to go exploring, but whatever. I heard the car pass by again, headed to the main road, before too long. On Thursday morning, a couple and their dogs walked on the road in front of the van; the woman and I waved at each other. Several hours later, they walked past again, going back to their vehicle, I assume. On Friday the sound of a man and a little boy walking by caught my attention, but other than those situations, maybe two other cars driving on Route 8211, and a few aircraft flying overhead, I only heard the sounds of nature. I absolutely enjoyed my time in the Saddle Mountain area, and hope to stay there again. I took all of the photos in this post. 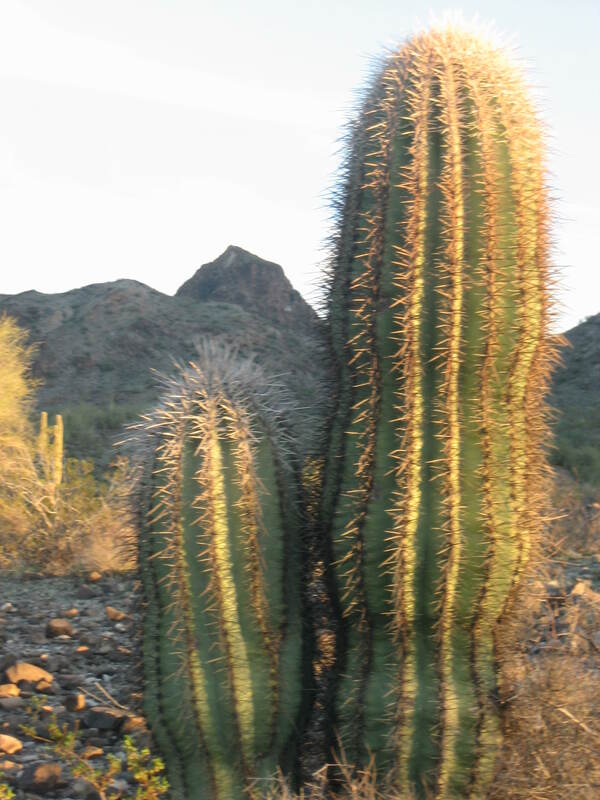 They were all taken in the area around where I camped near Saddle Mountain. Boondock–Staying somewhere (often public land) for free. Some people use boondock interchangeably with dry camp, while others differentiate between the two and use boondock only in relation to public land. *Class A—RV that looks like a bus with a flat front nose; motorhome. *Class C—RV with a van nose and an overhead cab with a bed. CRVL–I saw this twice at the RTR and had no idea what it meant, until I saw it spelled out in tiny letters at the bottom of a sticker. CRVL stands for Cheap RV Living, the website, as in http://www.cheaprvliving.com/. *Dispersed camping–Camping on public land in places other than official campgrounds; sometimes called primitive camping. Dry camping–Camping with no hookups, sometimes used interchageably with boondock. Full-timer–Someone who does not have a sticks-n-bricks house; someone who lives on the road. Part-timer–Someone who has a sticks-n-bricks house where s/he lives at least sometimes; someone who lives on the road sometimes, but also lives in her/his own conventional home sometimes. Rig–What one drives and lives in. My rig is a conversion van. A rig can be a cargo van. A rig can be a pickup truck with a slide-in camper. A rig can be a car or an SUV. A rig can be a motorhome. A rig can be a Class A, a Class B, or a Class C. A rig can be a combination of a travel trailer or a converted cargo trailer or a 5th wheel or a tear drop or a popup and a tow vehicle. 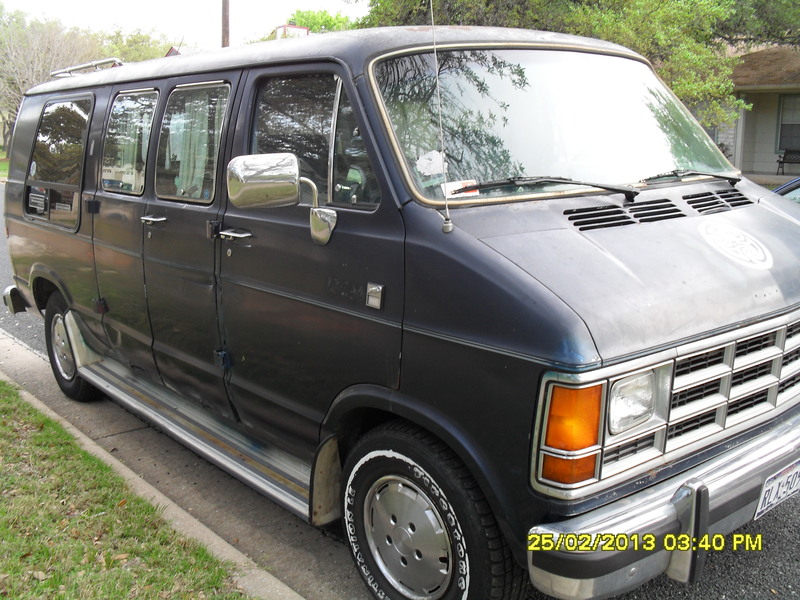 Rubber tramp–A person who travels and lives out of their vehicle (normally an RV, van, bus, etc.). They stop and stay wherever they choose for however long they want, but eventually, so as long as there’s a way to put gas in their tank, move on. (from Urban Dictionary, http://www.urbandictionary.com/define.php?term=Rubber+Tramp) Not all folks at the RTR would consider themselves rubber tramps. 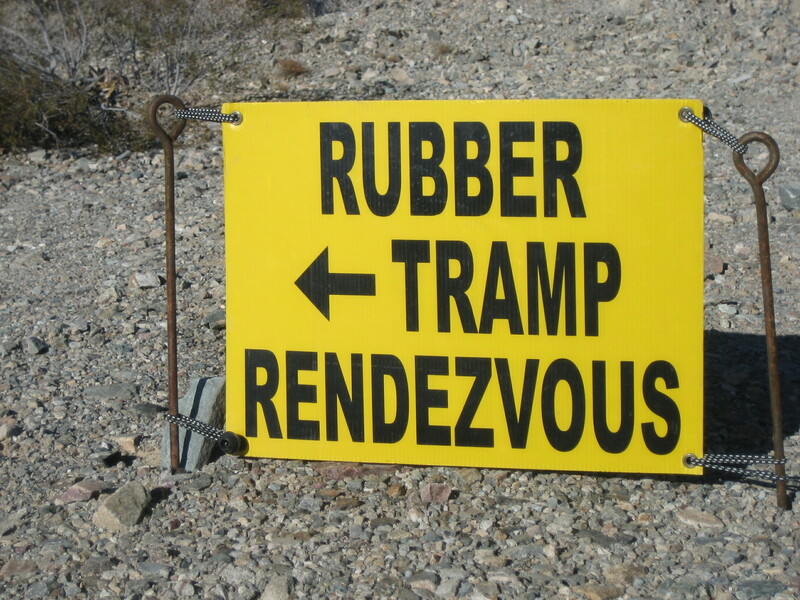 Rubber Tramp Rendezvous (RTR)–A winter gathering in Quartzsite, AZ for folks who live on the road (either full-timers or part-timers) or who want to live on the road. At the RTR there are seminars about living on the road, group meals, and opportunities to meet people and hang out with friends. I’ve written quite a bit about my experiences at the RTR; see those posts here: http://www.rubbertrampartist.com/2015/02/21/the-rubber-tramp-rendezvous-week-1-2/, here: http://www.rubbertrampartist.com/2015/02/24/rubber-tramp-rendezvous-week-2-2/, here: http://www.rubbertrampartist.com/2015/02/27/thoughts-on-the-rtr-2015/, and here: http://www.rubbertrampartist.com/2016/01/23/report-on-the-2016-rubber-tramp-rendezvous/. Also see http://www.cheaprvliving.com/gatherings/ for more info about the RTR. RV–Recreational vehicle. RVs include motorhomes, 5th wheels, travel trailers, and Classes A, B, and C.
Solo–Traveling alone, usually said in regards to a woman. The assumption that most women travel with a man is often made, so a distinction is sometimes made when a women travels alone. I’ve never heard anyone asking a man if he is solo or hearing a man describe himself as solo. Stealth parking–Living in one’s rig (especially in a city) without others knowing one is living in one’s rig. For more on stealth parking, see http://www.cheaprvliving.com/blog/bobs-12-commandments-for-stealth-parking-in-the-city/ and http://www.cheaprvliving.com/blog/stealth-parking-locations-part-2/. Toad–(This was a new one to me at the 2016 RTR. )–A vehicle towed behind an RV. I guess because the vehicles are towed, people started calling them toads. People in big motorhomes often pull a vehicle behind the motorhome so they can park their rig and use the smaller vehicle to drive around for errands and exploring. 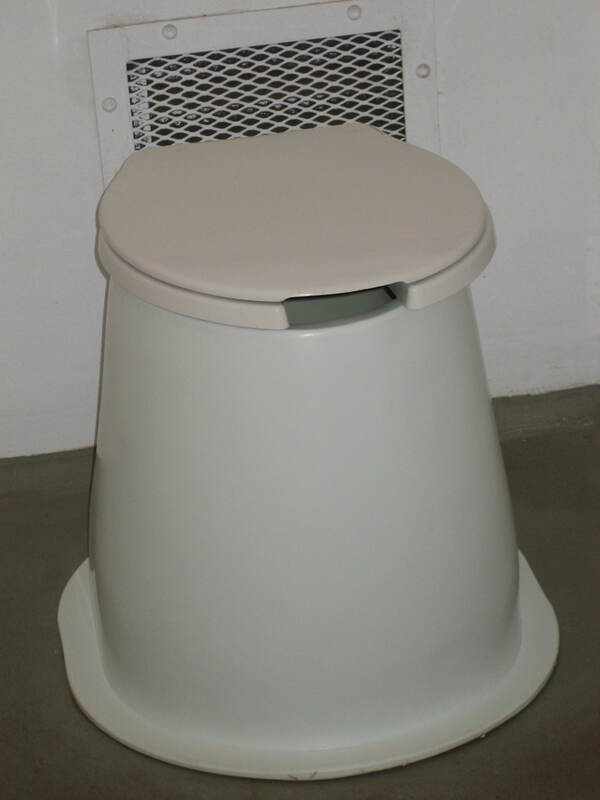 Vault (or pit) toilet–Non-flushing toilet sometimes found on public land.